Washington, NJ: A food-grade vibrating fluid bed drying and cooling system from process equipment manufacturer The Witte Co., Washington, New Jersey (www.witte.com), reclaims up to 50% of the energy lost in the exhaust airstream. Drawing the dry, heated exhaust air through either a continuous pulse jet dust collector or cyclone, the Witte dryer – cooler captures the process air and returns it to a gas furnace for recycling. Energy consumption and emissions to the environment are reduced along with the size of the carbon footprint. 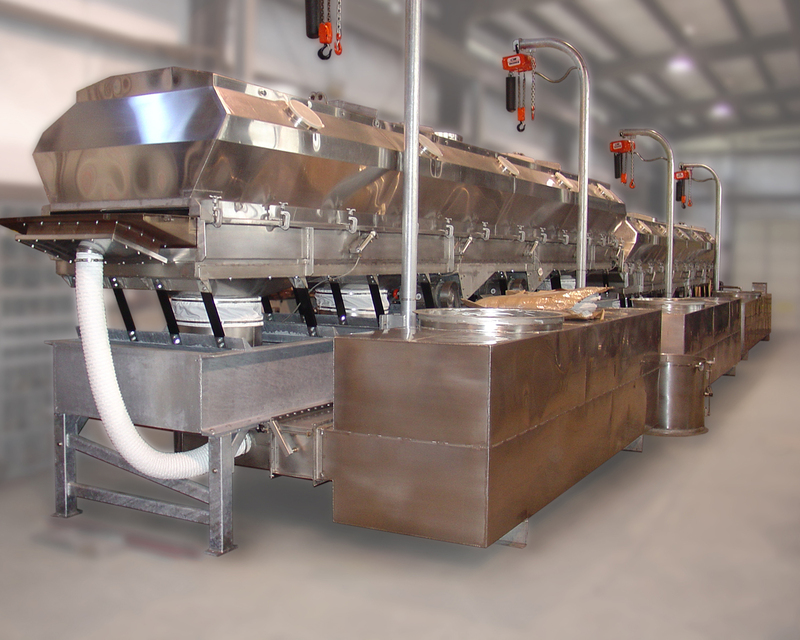 Devised, manufactured and in operation for a major, global food processing company, the sanitary process equipment features 100% stainless steel construction and food grade polish to meet FDA requirements for sanitary processing. A Teflon®-coated conveying surface is included to withstand frequent washdowns and promote smooth, non-stick product flow from entry to discharge. Spanning 60 feet in length, the fluidized bed cooler – dryer is designed with the company’s signature automated hoist to safely remove the entire steel hood for unimpeded access to the full length of the dryer deck for inspection and easy cleaning.